—Hannah Arendt, The Life of the Mind [1971-78]. —Aldo Rossi, L’Architettura della Città. According to Aldo Rossi, the Palazzo della Ragione in Padua is a paradigmatic example of the impossibility of circumscribing function to form and the extreme fragility of the bonds that connect the two. Rossi uses this example to cast doubt over the existence of a direct correlate between buildings and the way they are used and transformed over the course of time. But if we follow Rossi and agree that function is not reducible to form (nor vice versa), then we must conclude that neither can form, a priori, be political but that, in fact, it can only be re-politicised again and again, over the course of time, in a never-ending, recurring cycle. He reaches this conclusion in L’architettura della città when he separates the main component of the polis – politics – from its construction: politics as choice. However, we cannot avoid thinking about how some of the most primordial acts in architecture cannot be separated from the political, nor the political separated from form in its most primitive phase. A first layout, the Cardo and the Decumanus – the mark on as yet uncolonised ground – or the construction of a wall – undoubtedly one of the most elementary forms of architecture – may be purely political acts to the extent that they mark out an inside and an outside, a way of denoting ownership. At this moment in time, architecture is presented in all its nakedness as a political act, not exempt of violence, and the question then transfers its focus not so much to the future of architecture or the political capacity of form as to its prior state, to all that precedes it: who decides what building is sited in a certain place in the city? Who decides on the urban laws that precede and predetermine a universe of forms still to be unravelled? If, as Rossi affirms, the image of the city is always chosen through its political institutions, the question must then fall to them, especially at a time when new forms of government are being demanded. Any of the numerous social movements that have arisen in recent times, from 15M in Spain to Occupy Wall Street in New York and including Taksim Gezi or Tahrir Square, despite their different natures and motivations, have all revealed not only a sea change in the very idea of public space and the way in which it has been expanded through technology, but a common demand of new forms of governance that are more democratic and transparent. Precisely, the pacification and systematic homogenisation of these public spaces are evidence showing to what point the physical space continues to be the last step on the ladder where any form of renewal of all reigning hegemony can be represented and begun. Beyond new technologies, the functions originally inherent to the public space, such as representation or meeting – celebration, partying – have been maintained unaltered. The public space can undoubtedly be considered as the legitimate space for celebration of the political. 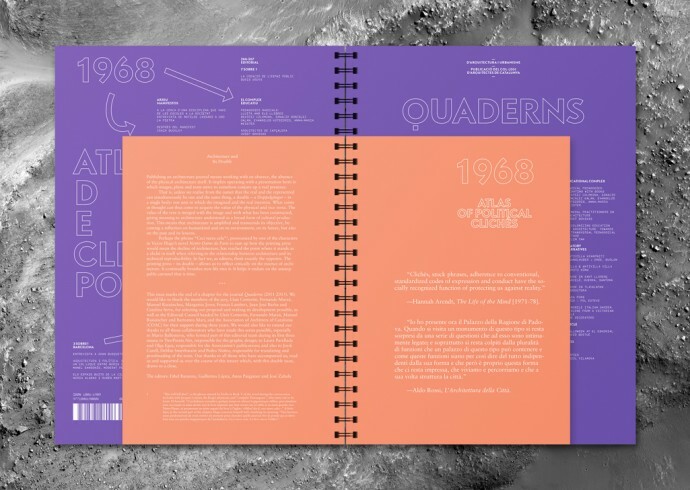 This issue of Quaderns explores some of the questions raised in the previous one, House and Contradiction. While that issue focused on the relationships between domesticity and politics, this one aims to analyse the relationship between domesticity and the public space. This is a logical continuation if we take into account to what extent the very definition of the domestic often blurs the boundary that exists between the urban sphere and the home, between the public and the private. It is impossible to understand the domestic without understanding its indissociable bond with the public space, their complementary nature. What should the architect’s role be with regard to public space and architecture in the midst of the new desire for regeneration? What are the boundaries – political, factual and legal – of the architectural discipline itself and how can the game rules be redefined? Ultimately, what is the real political capacity of architecture? Despite the topical nature of these questions – their belonging to the world of clichés – the continual formulation of these recurring themes remains necessary insofar as they act as a talisman, as a spur capable of endowing architecture with meaning if we want to understand it exactly as it should be: a form of commitment. /// For this double issue we have contributions by several practitioners and theorist, including among others: Núria Alabao, Pier Vittorio Aureli, David Bestué, Josep Bohigas, Craig Bucley, Joan Busquets, Matilde Cassani, Curro Claret, Núria Colomé, Beatriz Colomina, Cristina Gamboa, Ignacio González Galán, Boris Groys, Owen Hatherley, Evangelos Kotsioris, Moritz Küng, David Martínez, Rubén Martínez, Anna-Maria Meister, Zaida Muxí, Marina Otero, Ugo La Pietra, Dafne Saldaña, Manel Sangenís, Saskia Sassen, Malkit Shoshan, Pelin Tan and Oriol Vilanova. For the Observatory, ‘New Narratives’, we have: Brandlhuber + Emde, Burlon; Barceló, Guerra, Santomà; Productora; Goig – Pol Esteve and The Decorators.